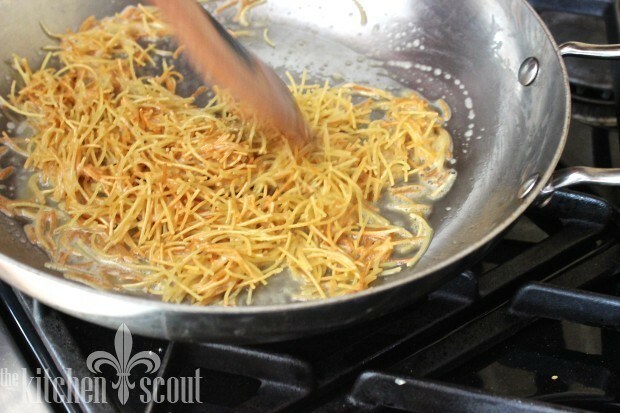 Chances are you are reading this post on Friday, April 24, 2015 since The Kitchen Scout emails are sent out to subscribers on Friday mornings. April 24, 2015 marks the 100th anniversary of The Armenian Genocide, an event in world history that has played an integral role in my life as well as in the lives of Armenians around the world. There have been countless articles written about the Genocide in the week’s leading up to this important anniversary and I have included some of my favorites at the bottom of this post if you are interested in some “light” reading. Like most Armenians, I have spent much of my life trying to educate anyone who will listen about what many consider to be the first genocide of the 20th century. It was something I felt passionate about and my obligation to do. Why? For one reason, it is not an event that has been widely taught in most history lessons. Armenia was a faraway place that most people had never heard of when I was growing up. In fact, it was a strategically unimportant, landlocked republic of the Soviet Union until it gained independence in 1991. For another, it’s because responsibility for this event has never been taken and there are still countries and politicians who refuse to use the word genocide in reference to the events of 1915. In 1913, my grandmother, Araxie was about 18 years old when she came to this country as a “picture bride” to marry my grandfather, Mgrdich (me-gr-ditch) who had previously emigrated to the United States. As far as I know, she left behind most of her family with the exception of one sister who also came to America. Her two brothers were photographers and they were early victims of the “massacres”. Of her remaining two sisters, one died in childbirth, and as far as I know, her identical twin sister and her husband also perished. As for her parents, I do not know what happened to them. I still hope that some day I will find all the answers, but for now, this is what I do know. Why don’t I know more? My grandmother was almost 70 when I was born. She had five children, my father being her youngest and I was the second youngest of her ten grandchildren. While we were very close and lived only two streets apart (my big fat Armenian wedding? ), we did not have heart to heart conversations about her youth. She spoke “broken” English as they used to say and was a very conservative woman as is typical for our culture, Kim Kardashian nothwithstanding. We never spoke openly about her family or the genocide. Her greatest joy was cooking for her large family and spending time with one of her dearest friends and sister-in-law, Pyloon. If I could turn back time, I might try to talk with her more about her life before she came to America. I would like to understand how it must have felt to leave her family behind to start a new life, perhaps knowing that theirs was destined to end. I would have asked more questions and hope she was willing to answer them. But, I can’t turn back time. And I don’t have the power to make large countries or politicians say the word genocide out loud. What I can do, is to honor my family and this event by perpetuating our culture and to share the stories that I do have and hold in my heart. Which of course, leads us to the discussion of food, an important piece of any culture’s continuity. 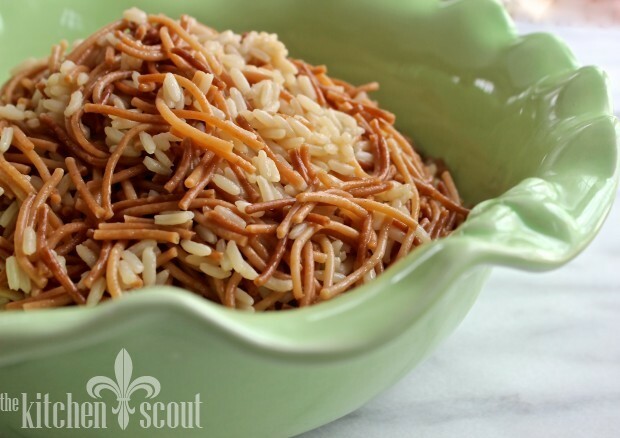 Pilaf is a staple of the Armenian diet and I ate it all the time as a child. I continue to make it for my family. It’s a simple dish, but it is like a warm hug in a bowl. Made with either white rice or with bulgur wheat, pilaf is usually a side dish served with chicken, lamb or beef. I don’t serve it with pork or fish, but I suppose you could. Pilaf can also serve as a main dish for vegetarians. Everyone’s pilaf is a little different. Some like it super dry and some like it wet. Most will agree that the pilaf at the bottom of the pot is the tastiest. If you’re a regular reader of my posts, you may recall Easy Roast Chicken? I mention in it that pilaf is always served with chicken in an Armenian home. My friend, Francine who you met when I wrote about Broccoli Salad with Peanut Sauce got in touch with me after reading about the pilaf and asked if I would share my recipe. I told her I would, but that I would need to demonstrate how to make it for best results. We agreed it would make a fun blog post! So, Francine came over to my house about a month ago and we made two versions as you will see below. I thought this week was the perfect time to share the recipe. This is not your boxed rice pilaf, or the kind they read off in your options of sides at a restaurant. I hope you make it sometime soon. 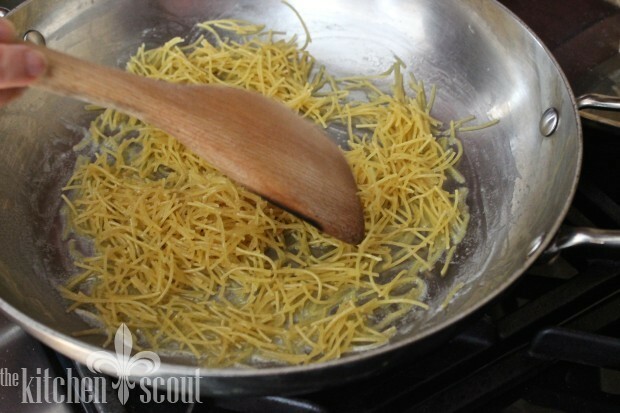 The next step is to melt “some” butter in a saucepan to brown the noodles. I put the word some in quotes because this is all up to how decadent you want your pilaf to be. I usually use about 2 Tablespoons but on holidays, I may add a teensy bit more. 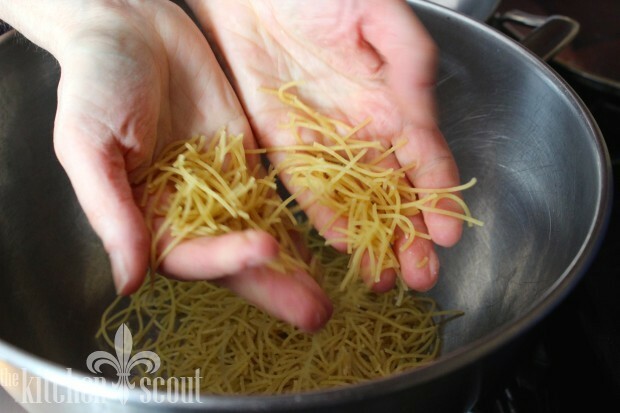 Some people toast their vermicelli in the oven to cut down on the butter content of the dish or to prepare the vermicelli in bulk for easy weeknight prep. 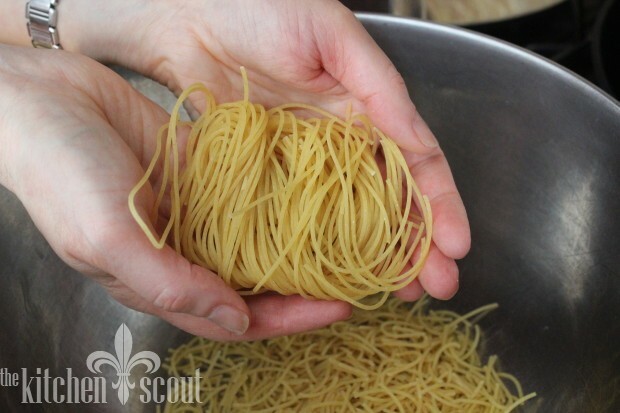 If you want to do that, you can start by laying the crushed noodles on a sheet pan and placing it in a 350 degree oven for about 8 to 10 minutes, making sure to watch it carefully and giving it a shake half way through for even browning. Francine is an excellent student as you can see! I had a pan going at the same time so that we could make two versions, one with rice and one with the bulgur wheat. 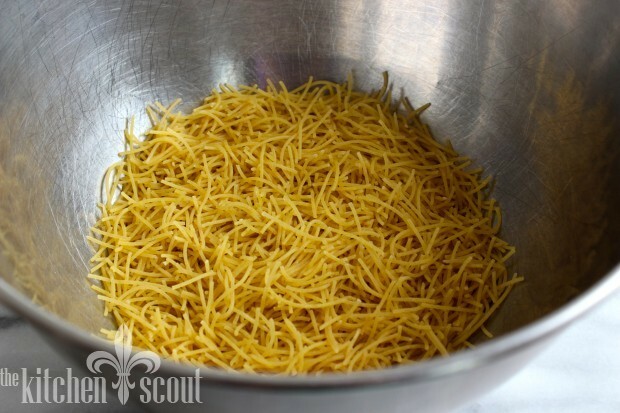 Next up, add 1 cup of long grained rice to the cooked vermicelli and mix them together so they are completely combined. I always use Uncle Ben’s rice for my pilaf, although there are others who use the Carolina brand. You can swap out an equal amount of medium or coarse bulgur wheat for the rice if you’d prefer. They taste completely different, with the bulgur having a nuttier and earthier taste. I love them both. Cover and simmer on low for about 20 minutes. 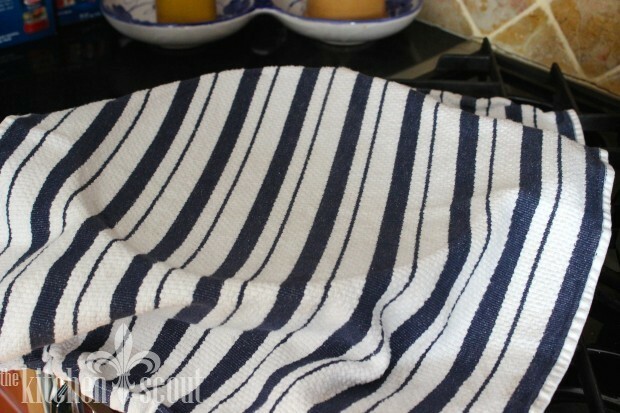 Whatever you do, do not stir the rice after you’ve put the cover on it. Don’t lift the lid either. In fact, just walk away and don’t look at it until the timer goes off! As for that extra butter I was mentioning before, sometimes this is when I will add another tablespoon or two to make the dish really special. 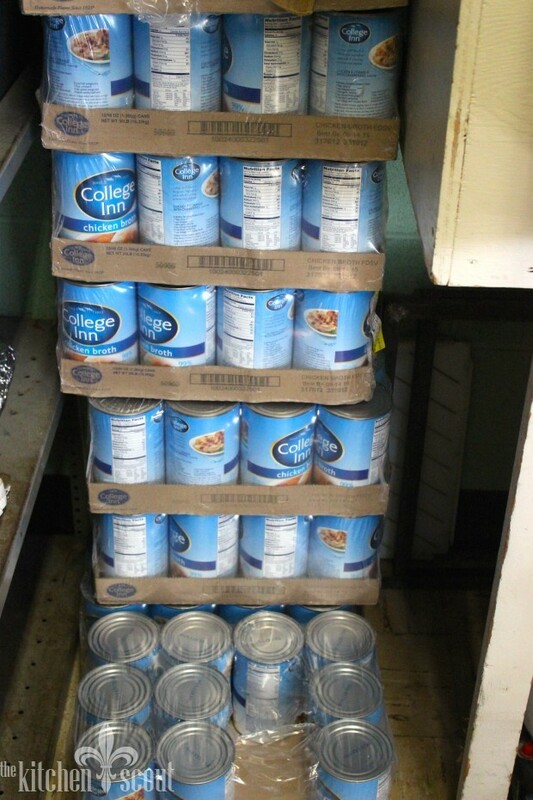 is ready to serve. That’s it! Four ingredients for a delicious side dish. 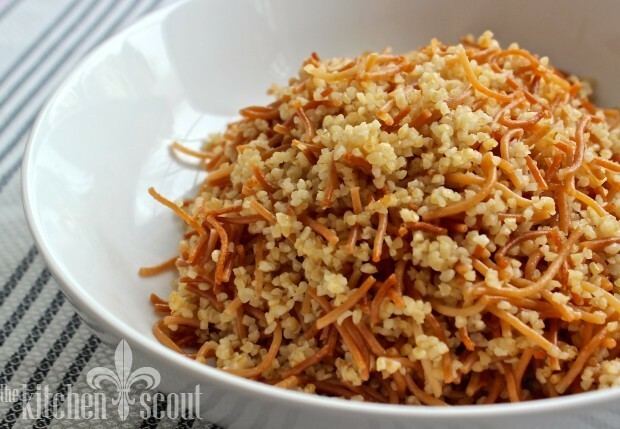 Bulgur wheat pilaf often has sauteed onions in it as well but this is a simple version for every day. My mom sometimes added one peeled, seeded and sliced Roma tomato to her bulgur pilaf. 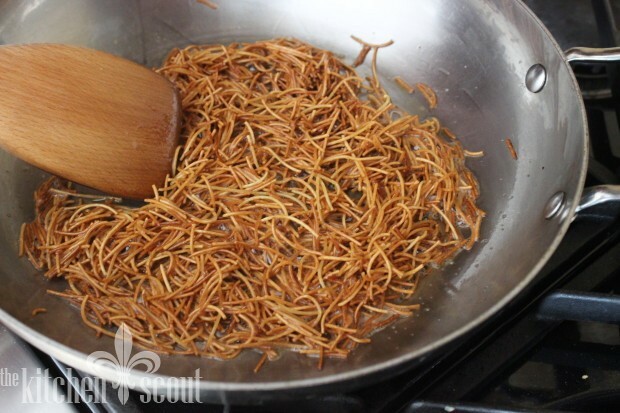 My grandmother added toasted pine nuts during the holidays. 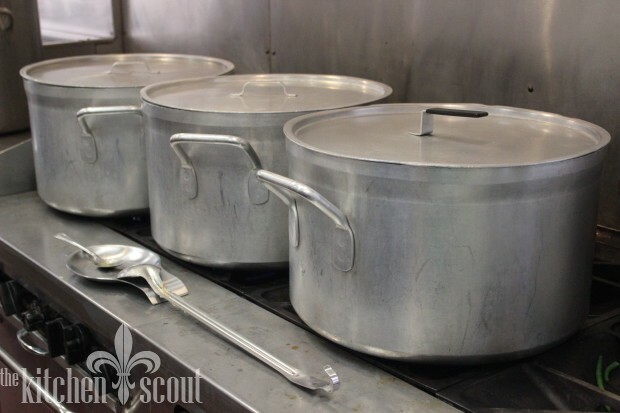 Just for fun, below is a shot of how much pilaf is made at our church for our Palm Sunday banquet which is just a fraction of what is made during our annual Bazaar! Trust me, it’s a lot of pilaf and their recipe is well guarded (sort of). Until her death at the age of 103, a Genocide survivor named Vergin used to make the pilaf for our church events. She was the sweetest person and very petite. She stood on a step stool so she could stir the pots! Which leads me back to my grandmother and the Armenian Genocide. For 100 years, Armenians like me have wanted the world to acknowledge the events of 1915 as a systematic attempt to eliminate them from the Ottoman Empire. From the Wall Street Journal, “Most independent scholars have described it as genocide, however, and more than 20 nations have formally recognized it as such. Pope Francis and the European Parliament voiced agreement last week.” If there ever were a time for universal recognition, it would be now. Thank you for allowing me a somewhat serious post this week about a topic near to my heart. Now go make some pilaf. * You can swap out an equal amount of medium or coarse grain bulgur wheat for the rice if you wish. Bulgur #2 or #3 is what you would look for in ethnic markets. In a 3-quart pot, melt butter over low heat. 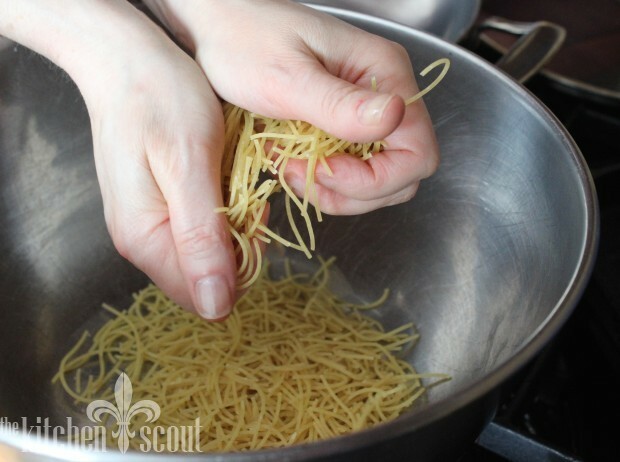 Once melted, add the vermicelli and sauté the noodles until they are browned, stirring constantly to prevent burning. Add rice and mix to combine. (recipe can be made up to this point early in the day and left at room temperature). 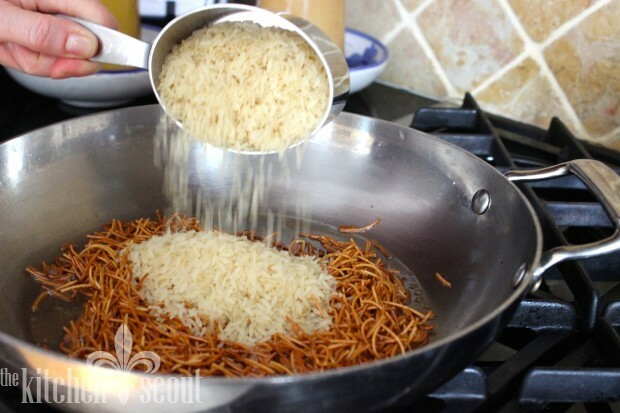 Add chicken broth to rice and bring to a boil. 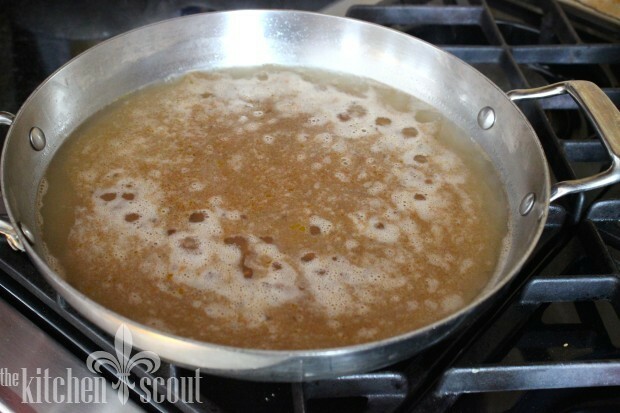 Cover, reduce heat to simmer and cook pilaf until all the liquid has been absorbed, approximately 20 minutes. Do not touch the pan until the 20 minutes has elapsed. Hi! Yesterday I finished the book The Road from Home … which reveals a little bit of 1915 Horrific events. Sadly we can see that similar events are taken place in this century. 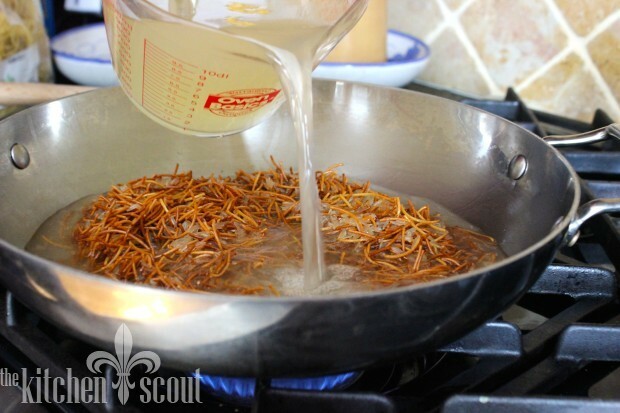 Since I finished I was looking for Armenian Recipes And found this blog. Thank you so much for sharing your story and recipes. I am so thrilled you found my blog, Judith and I appreciate your interest in our history and my stories as it relates to those incredibly sad events. Thank you for writing! My grandmother would use both rice AND bulgur in her’s. My great grandparents immigrated to the states to escape the genocide, and passed away very shortly after I was born – I don’t remember them save for hazy memories. But my grandma and mother both tried to maintain the history. I live in the south now, and the nearest middle eastern market is over an hour away. I’m throwing a southern twist into my recipe to make up for what I don’t have. Quinoa to substitute for bulgur … and I’m throwing some venison in, for curiosity’s sake. Thanks for commenting, Ashley! The combination of rice and bulgur is so interesting! This was my great grandmothers story as well as her recipe! It was my first “real” food as well as my children’s first table food and it’s a beloved staple of my childhood and my adult home. I don’t measure anything but the rice and the broth, otherwise it’s “a hunk” of butter and one coil of noodles per cup of rice. We used to make it with canned broth, but I have found these little sachets of condensed chicken broth from trader Joe’s that not only take up tiny amounts of shelf space but make DELICIOUS pilaf. People don’t understand if they didn’t grow up with this how much comfort food this is. It’s like macaroni and cheese to me. I will take a look at those packets from Trader Joe’s next time I am there! Thank you for commenting, Rachel. I especially like your analogy of pilaf to mac & cheese – it definitely is that kind of comfort food. My whole family loves it, bulgur wheat too! 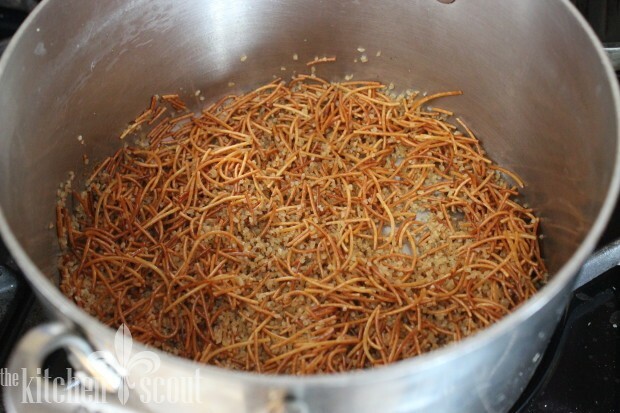 Just stumbled upon your post and pilaf recipe. My grandmother has a similar story as yours and just reading this and seeing the photos brings back so many good memories and smells. I have recently gotten into cooking some of her recipes and have her hand written ones but they are written in Armenian so I think I need a translator. To this day, my favorite dinner is a giant bowl of pilaf with a giant scoop of madzoon (plain yogurt) on top. Thanks for the memories!! You are welcome, Karen! Thanks for reading! Thank you for sharing your wonderful stories and recipes with me Val. I can’t wait to spend more time in the kitchen with you. What’s next, the red lentil dish from your church?!!! Terrific post Val! Enlightening on a topic I know too little about. Can’t wait to try the pilaf! Yum! Thanks, Amy. I hope you enjoy it and glad I could share this with you! Thank you Val for teaching, sharing and inspiring us in and out of the kitchen. Excellent post Val. Thank you for sharing your family history. NPR had a thought provoking discussion on this yesterday. 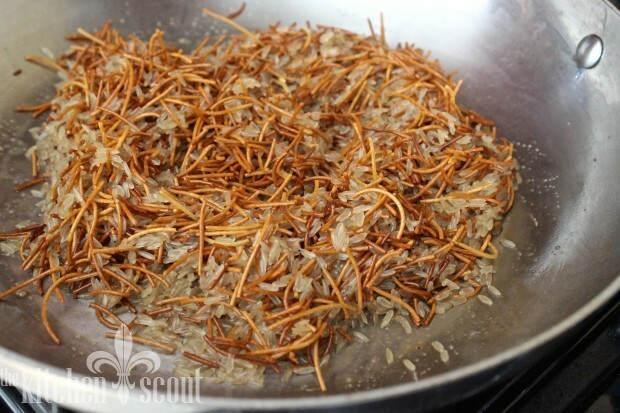 As for the rice pilaf – I sauté onions in the butter before I add the vermicelli (must be the Irish in me) . My favourite is to have it for breakfast the next day with a fried egg on top – amazing. Thank you, Ellen! I saw the NPR piece and they had another one this morning. Katie Couric has a great video up on Yahoo News too. Like the fried egg idea, although I like anything with a fried egg on top!! !